Friday Night Cat Fight » Blog Archive » 4/1/2011 – The “House Of The Rising Sun” Cat Fight! Hi, MTC. I sure didn’t know there were 9 versions of this song. It’s so sad that you can’t continue the cat fight right now. You know I wish you every success in working and providing, but I so much wish the cat fights could continue, even if it’s not Friday, and even if it’s only 2 songs. I think my vote will still go with the Animals; I especially liked their longer version that ended with the cool keyboard. Wow, 100 shows since leaving XM! Thank you for sharing your love of this great music with your fans. Hopefully you feel that love from us, your Prowlers. My vote is for Eric and the Animals this week. This is the version I grew up with and the one in which I compared the other great renditions to. Whenever the next FNCF will air, we will be here waiting for your intro without fail.. The best is yet to come for you and your wife. What a positive difference you have made these many weeks and years! FNCF LIVES! I was surprised to find that I really like the Frijid Pink version. Just a little to derivative of the Animals version to beat it out though. I can’t think of this song though, without remembering the guy who lived across the lake from me back in the 70s, who practiced his bagpipes on the bluff overlooking the lake on Sunday mornings. You have not heard Rising Sun until you’ve heard it played on tortured bagpipes. Really makes you appreciate the Animals. Always a big fan of old country blues so I finally decided on Ledbelly. I actually liked all of them. It was interesting to hear how the lyrics changed as the song became newer, and selected parts were recombined to make a new version. I saw Frijid Pink around that time but don’t remember if they played it or not. Actually, I can’t remember much about that night at all. Good luck on your new endeavor Matt. Hi, Matt: Like everyone else I wish you the greatest success and have really enjoyed the cat fights. This one was very interesting and I agree with you about Bob Dylan not copying the slower version of the song. I have to vote for the Animals though it was fun to hear all the earlier interpretations of this song and even the version by Frigid was fun. Take care and God bless you and your wife as you embark on your new career. This was the first song I learned on guitar and I still have a soft spot for it. It always pains me when I have to select the most popular version of a song, but the Brits were rather adept at taking songs like this and sending them back to us on steroids. So the Animals get the vote this week. I saw Eric Burdon live a couple of years ago and he still put on a smokin’ show. Matt, I’m glad you found a job, even if it’s not the ideal gig. One does what one must. We all thank you for keeping the Cat Fight going all this while. I agree with Yum Yum for the first part. For the second part. I don’t remember hearing this song without the organ. It wouldn’t be right without the organ, and I don’t particularly care for organ music. Without a doubt, The Animals are far and away the best with this song. MTC thanks for 100 and all of the XM shows! Although I am originally from Detroit and Frigid Pink rocks this tune and Nina Simone was fabulous, the Animals are truly ANIMALS and king of this song. MTC please get back to us Prowlers when you can — either way, I will wait for the professor of early rock and roll to return to class. First Off congrats on the big 100 I really like the way Joan Baez did it, its reminiscent of Ode to Billy Joe, which I recently heard, Thanks as always You never cease to amaze with what you pull out. The song came a long way from the Alan Lomax recording to Frigid Pink. I’ll still have to go with the original version I heard, and believed was the original for many many years, the Animals. The organ solo is absolutely killer. As far as the more acoustic versions, it would have to be Dylan. It sounds like I think it should sound if done with only guitar and vocal. 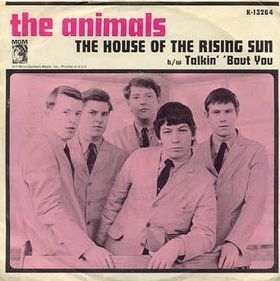 The Animals version of The House of the Rising Sun is just so amazing. That organ solo just blows it away and that is why Their version of this song as always been my favorite. I also enjoyed Bob Dylan’s rendition of the tune as well the passion and soulfulness in his voice was stunning. I just had to go with my favorite and vote for The Animals. Forgive me for responding so late to this. I’ve never heard a version of this song that I didn’t like, and I’ve heard all the version presented except the Nina Simone one, which was great. For years, I’d assumed that Van Ronk was the one who took it to 3/4 time, (which is why he said that Dylan used his arrangement) until I heard the Roy Acuff version a few years back, which blew that theory. I had to vote for that one (Bashful Brother Oswald’s Dobro doesn’t hurt) based on that, but all the versions were great. Thanks for putting them together. Ok, it’s been a bit over 5 years since I first listened to this cat fight. I happened to listen once again this evening and will cheat a bit and vote for Joan once again. I had never heard it prior to this 5 years ago and still love it. Just thought I would post this time and say thanks for airing these over the years. They are missed.